Download a copy of Much Ado About Nothing to your ibooks or download a free ePub version. Use the Much Ado Study Guide as we read the text. The study guide is optional to complete but may be useful for reviewing the details of the story prior to the test. Prior to reading Much Ado About Nothing, we will do a quick review of Shakespeare's life and times. The background knowledge from the presentations will be helpful for understanding the text. Also, several questions one the final test will come from these presentations. With a group, you will research one of the following Presentation Topics. After completing the background presentations, review the Intro Notes on the Plot of the Play. These notes will be used for your final Shakespeare Test. Watch the full film of Rupert Goold’s Macbeth starring Sir Patrick Stewart and Kate Fleetwood. Following a London West End run in December 2007, a sold-out limited engagement at the Brooklyn Academy of Music in March 2008, and a subsequent eight-week run on Broadway, director Rupert Goold’s gripping stage production of Macbeth was filmed for television at the end of 2009. Patrick Stewart in his triumphant, Tony-nominated performance as the ambitious general, and Tony-nominated Kate Fleetwood as his coldly scheming wife. On March 31, 2011, Macbeth was the proud recipient of a George Foster Peabody Award. 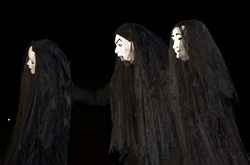 Watch Macbeth on PBS. See more from Great Performances.